On May 15 2016 Turk civil rights activist Mrs. Soheila Kargar was arrested at her home by Iranian security forces in Northwestern city of Qazvin. She has been released on bail on 2nd June. Two days later, Mrs. Kargar’s family could find out that the responsible judge for the case is Mr. Baghdadi at Branch 3 of Court of Qazvin. The 4th day after the arrest within her family insistence Mr. Baghdadi announced that she was transferred to Evin prison in Tehran. In the evening of that day Soheila rang her family from Evin prison and told that “she was all right and the interrogators had dealt with her respectfully and she was held in solitary confinement.” according to Javad Kargar. Mrs. Kargar’s family was been informed that the accusation for the arrest is “founding an illegal group”. So far AHRAZ has not received any details about the accusation. Finally on 2nd June after 18 days of being in confinement at Evin prison, Soheila Kargar was released from Qazvin prison on the bail of 500 million IRR. Mrs. Kargar, the turk activist, whose activities have been on the ethnic rights and women’s rights. She was candidate for parliamentary elections in city of Qazvin however she was refused approval Guardian Council. She is married and has a 5-year-old girl. On 31 May 2016, Branch 112 of the Criminal Court in Tabriz sentenced 26 fans of Tractorsazi FC of Tabriz to flogging, fines and imprisonment on charge of “disturbing the public peace through participation in clamouring”. The activists had been arrested during during the football match between Tractor and Siyah Jamegan teams on November 20, 2015 following the “Anti-racism” mass protest in Azerbaijani cities in Iran. 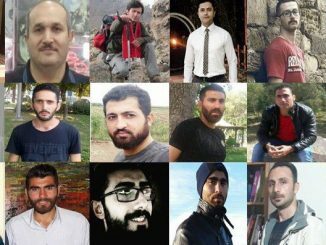 They had been transferred to Tabriz Central Prison and released on the bail after one day of detention. According to the report of Human Rights Activists News Agency in Iran (HRANA), the trial had been held at Branch 112 of Criminal Court headed by Judge Ali Piri On May 22, 2016. Based on the verdict, the activists; 1.Amin Seraj Rezaee 2.Mohammad Bagher Harirchi 3.Ahad Ebrhimpour 4.Majid Jaefarzadeh 5.Mir Mohammad Babaee 6.Farzad Nasiri 7.Siamak Makhmouri 8. Javad Soltani 9.Yavar Soltani 10.Hasan Ebrahimpour 11.Arouj Dehghani 12.Maysam Khalafi Zangi 13.Mohsen Hosseinzadeh 14.Jahanbakhsh Soltanzadeh have been sentenced to pay five million IRR fines instead of imprisonment and three million IRR fines instead of whip as well as the activists 15.Mehdi Shirzad 16.Hadi Hosseinzadeh 17.Farzad Haydari 18.Ali Rshidi 19.Majid Naghizadeh 20.Rasoul Mohammadi Malalar 21.Amir Karimi 22.Shahin Shirinazhad 23.Hassan Jamali 24. Millad Pour Mohammad 25. ESmael Dehghani 26. Karim Hosseinzadeh have been sentenced to “one year and seventy-four lashes”. The verdict has mentioned that an appeal can be made within twenty days after the notification. About “Anti-racism protest” in Azerbaijani cities of Iran. On 25 May 2016, seventeen workers of the gold mine of Agh-Dare in Tekab (West Azerbaijan province) have been flogged, based on the News Agency of ILNA. It is also reported that some of the workers have been arrested after the implementation of the lash sentence. According to the workers lawyer Vahid Yarifor, they were sentenced to between 30 and 100 lashes, fine and imprisonment. The trial have been held on two separate court rulings, the branch 110 of Criminal Court in Tekab and branch 10 of Appeal Court in Urmiyeh. The accusation have been The allegations consisted of “preventing people from doing business by disturbing the peace”, “insulting the mine’s security guard”, “destruction of a guard’s clothing and illegally detaining him” and “deliberate destruction of the mine’s signboard” which the suing had been done by the employer. source, some of the workers have been arrested after the lash sentence has been carried out. in December 2014, in protest against the sacking of 350 seasonal workers, a large gathering of laid off workers took place in front of the guards’ house of the “Agh Dare” gold mine in Tekab city in West Azerbaijan province. As protest at the loss of their jobs three of the sacked workers attempted to commit suicide on the mine site but survived after being hospitalised, according to ILNA news agency. It is said that Agh-Dare is Iran’s second-largest, with more than 30 tons of proven reserves and one of the biggest gold mines in the Middle East. The Pooya Zargan Company operates the Agh-Dare gold mine who had sued the workers. Tabriz Central Prison officials prevent delivery of optical medicines to the Azerbaijani Turk activist Morteza Murad Pour. He has recently come back to the prison after an emergency leave. He was prescribed to take optical medicines to stop medical problems that his eyes have received. Those close to this activist are concerned if this will intensify his medical problems. Previously, Tabriz Central Prison officials had also put in effect the same prevention of delivery of optical medicines to another Azerbaijani Turk activist Hoseyn Ali Mohammadi. Morteza Murad Pour was arrested by the security forces on 18 May 2015 and was transferred to the Tabriz Central Prison. This activist had been sentenced to three years in prison in 2009 in Tabriz Revolutionary Court on the accusations of assembly and offense against security of state and propaganda against regime. He was also arrested on 22 May 2009 during demonstration at El-Goli Park of Tabriz City after giving slogans in relation to the linguistic and national rights of Azerbaijani people in Iran. He was then released on bail after six months in detention. On 31 May 2016 Mohammad Rashidi, nick-named Okhtay, was arrested after going to the Tabriz Court to serve his sentence of 4 months in prison. He was then transferred to the Tabriz Central prison. In August 2013, Rashdi was sentenced to 4 months in prison by the third branch of Tabriz Revolutionary Court on the accusations of assembly and propaganda against regime. Republic of Azerbaijan; Khalide Khalid (Shahriar-olog and member of the Azerbaijani science academy) and Shamkhal Hoseynof. On 25 June 2013, Rashidi was released on bail from Tabriz Central Prison after 56 days in temporary detention. Previously, on 15 August 2012, Rashidi along with three other Azerbaijani Turk activists was detained by the security forces while they were delivering assistance to the earthquake-affected people of Varzghan. On 24 May 2016, during a football match between Tractor Sazi and Al-Nasr of UAE held in Tabriz, some of the football fans were arrested by the security forces. The name of those arrested have not been identified yet. Only Seyed Vahid Shahbazi, a student of architecture at Ahar University has been mentioned. During this football match, some of the activists had requested release of Azerbaijani Turk political prisoners, through showing placards. 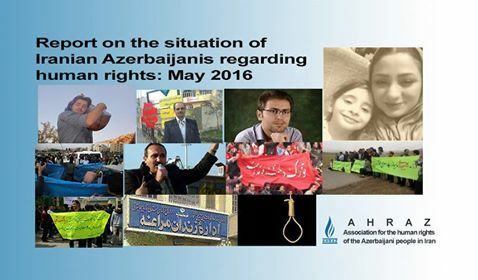 Rasoul Razavi Azerbaijani Turk political prisoner is still under hunger strike since 19 May 2016. The reason for the hunger strike is said to be because of unfair legal proceedings, re-execution of omitted court orders and uncertainty of his court file related to the anti-racism demonstrations. His physical situation is deteriorating. Razavi was detained in Tabriz city on 12 November 2015 after massive anti-racism demonstrations held in different cities of the Azerbaijani region. In October 2015, Branch 2 of the Tabriz Revolutionary Court sentenced Razavi altogether with Hoseyn Rakhshani Kia and Sevindik Lotfi to two years in prison on the accusations of propaganda against regime. This court order was issued after his detention during Quds day because of showing support for Uyghurs being under Chinese repression. Razavi has been arrested by the security forces, sentenced to prison and put in jail several times in 2011 – 2016. 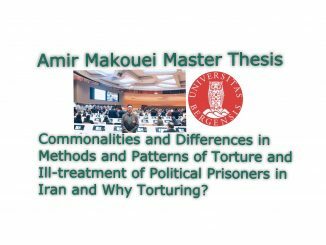 He has been also tortured during his detention at Tabriz Intelligence Detention Centre. On 1 June 2016, Abbas Lesani Azerbaijani Turk activist from Ardabil city along with his wife Roghayeh Alizadeh became present at the Branch 1 of Ardabil Revolutionary Court and their court session was held. Turks in Iran. His wife has been mentioned to be cooperating in this accusation. Lesani was released on bail from Adel Abad Prison of Shiraz city on 25 May 2016 after hunger strike that he went under because of lack of release from prison on due time and fabrication of new files against him. There are some 11 other prisoners who went under hunger strike in support for and solidarity with him. Lesani had been exiled to Shiraz Prison and was supposed to be released on 18 May 2016. On 8 May 2016, at the same time of the “Workers Week”, workers of the “largest textile factory in the Middle East” (Arta Tejarat Zarrin) in Ardabil gathered in front of the governor building and demanded investigation into their claims. At the rally, workers pointed to the economic problems due to lack of demand over the past few years. They demanded the presence of Ardabil governor to handle their problems. Referring to one of the workers: they did not receive their demands over the past few years, he added, none of the manager of the factory does specify what is the demands of the workers. He noted; the demands and rights of workers have not been paid for years and due to non-payment of receivables, the workers are in debt and surviving by loans, however failing to payback a loan also causes problems for them. On 12 may 2016 Mr Behnam Mohammadi, 35 years old, was executed after 5 years imprisonment in Maragheh prison, East Azerbaijan province. He was executed on charge of drug-related crime. Every year a large number of prisoners are executed in Maragheh prison in charge of drug-related crimes.